Are you ready to dive into the mermaid alter ego that you know is waiting deep down in your soul? We hear you. Can you picture your deep sea lifestyle? Glamour comes easily to undersea creatures. The ocean is full of sparkling fins and highlighted with iridescent colors. So it's no wonder that us land lovers are integrating the style into our daily lives. From bath bombs to seat covers and truly awesome ombre dye jobs, how could this new wave of oceanic inspired everyday items not inspire people to be happier? 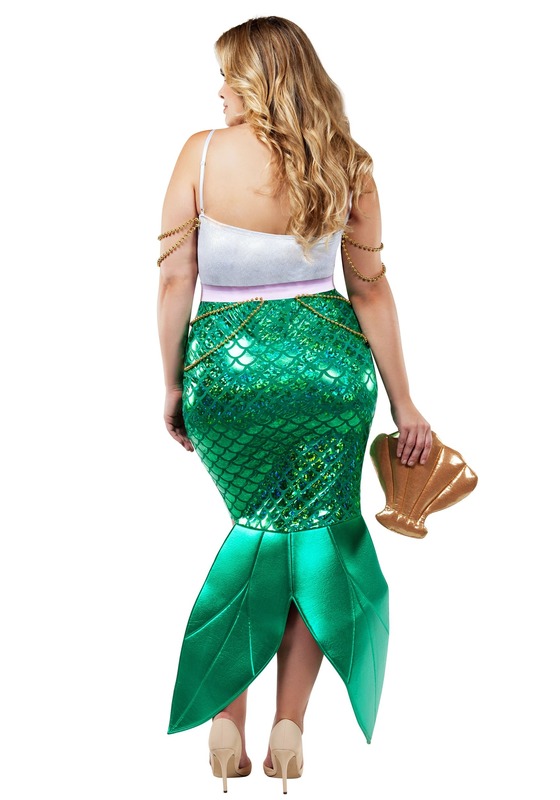 So whether you've remodeled your bedroom in turquoise, lavender, and aquamarine blues we think it's time you found the perfect mermaid costume to ride this wave! This dress is sure to be a showstopper. The tail is a deep, iridescent green with printed scales on the pencil skirt section. The fin has a shiny surface and quilted lines giving it a fishy look. The skirt is high waisted and topped with a pearl bodice and a sculpted shell neckline. The belt is light pink and has a gold shell buckle with gold beads hanging around the hips gracefully. These beads are repeated along the straps and draped around the shoulders. In an outfit like this, you're ready for your undersea debut! 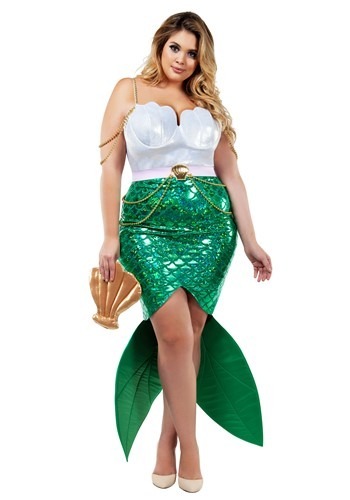 Now that you've found the perfect mermaid ensemble, you just might find that you're part of a new state of mind. This gorgeous look doesn't have to be limited to the confines of a Halloween party. From luaus to ocean themed boat parties, no one has ever been angry when a mermaid shows up at a party. That's probably because once the mermaid is there, you know it's going to be one shell of a night!